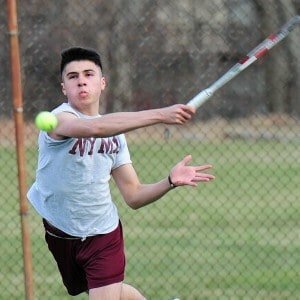 On Friday, April 13th the NYMA Boys Tennis Team was handed its first league defeat of the season with a tight 4-5 home loss to visiting Poughkeepsie Day. Three NYMA players won in singles with Brandon Fooks and Simon Lin providing the team’s sole doubles win. Fooks and Lin also got the first two singles wins for the Knights as well. Fooks won 10-6 at the 3rd position and Lin won 10-4 at 4th singles. NYMA tennis’ “youngest man” Adam Sun continued his winning ways with a 10-3 win at 6th singles. In doubles play, the duo of Fooks and Lin collected their second win as a unit, beating their opponents from Poughkeepsie Day 8-1. Also on Saturday, April 14th, the NYMA Ultimate Frisbee Team played host to defending champion Marvelwood and the game did not disappoint. Team captain Nigel Petti-Fernandez was lights out as he had 15 assists in the thrilling 15-14 victory. Also having a big day was Cadet Will Mayfield who scored 14 points all while jumping over the opposition. Cadet Daniel Geng also had one score in the win. On Wednesday, April 18th the NYMA Baseball Team traveled to the Hoosac School to kick off the season. The game was a great learning experience for the young Knights. The game ended in a 0-16 loss over 4 1/2 innings on a briskly cold night that was called early by the umpires due to the weather. Cadet Henri Racine pitched a consistent game with many strikes and plays leading to outs. The knowledge and overall experience gained that night will greatly help us this season. The Knights will take the field again on Friday as they play Marvelwood. On Wednesday, April 18th the NYMA Boys Tennis Team moved to 2-1 this season with a 5-1 win over Hoosac Academy. Phil Kim got an 8-0 victory playing his first match of the season while Matthew Montes led the way with 9-8, 12-4 win (with a 12-point tiebreak in the first set). Simon Lin followed with an 8-2 win and Adam Sun had another 8-0 victory at the 4th singles position. Montes and Lin partnered to get a 6-2 win in doubles. On Wednesday, April 18th the NYMA Ultimate Frisbee Team lost to Poughkeepsie Day School on a cold spring day by the score of 1-15. PDS came in and played an excellent game as they executed their offense very well. The Knights got a score from Branden Evans as well as some great defensive knockdowns and takeaways from Nigel Petti-Fernandez. Cadet Kris Wu played solid defensively as well. Eighth-grade Cadet Andrew Weng also played well and is really improving so far in this young season. The Knights are 1-2 overall and will play Darrow this Saturday at 2:30 pm.